Well hello there! We meet again. Last week I was in bed for three days with a horrible bug, but I got plenty of rest and took care of myself. I had no interest in getting dressed or reaching for beauty products, which is why I didn't blog. 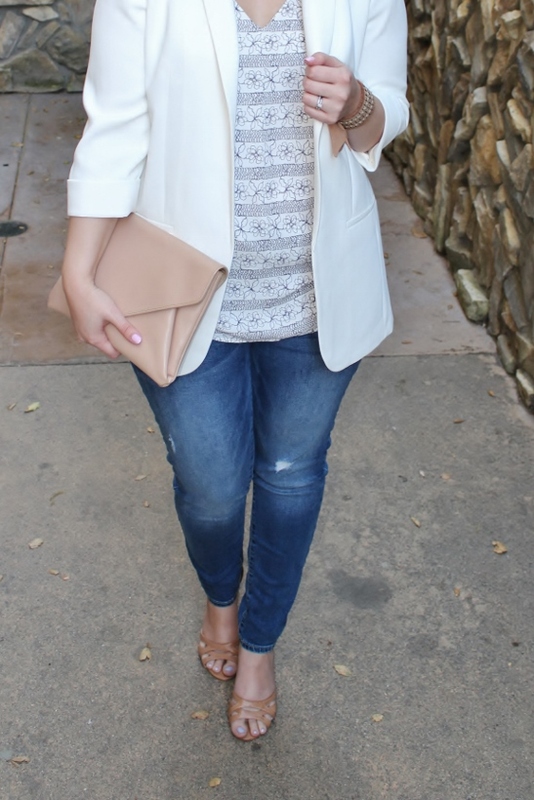 I'm back with an outfit that is the perfect transition to Spring. Aside from the allergy fits that plague me, the season is beautiful here and I welcome it with open arms. Can we talk about my new Stella & Dot bracelet?! It feels strange to call it that because it's such a unique piece. A swath of silk chiffon hand embroidered with gold and silver metal. It ties into a beautiful bow and can even be worn as a choker. This is why I love Spring - I can be as girly as I want to be! 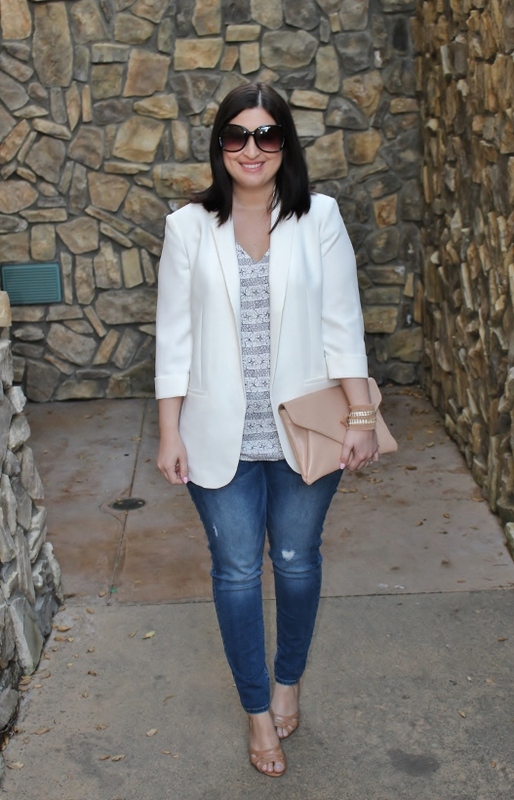 love the white blazer, so perfect for Spring. I always love your girly combos! So polished and sophisticated! And that bracelet is really gorgeous! Glad you are feeling better! Your bracelet/choker is such a gorgeous piece! I love its versatility too! You look fabulous! 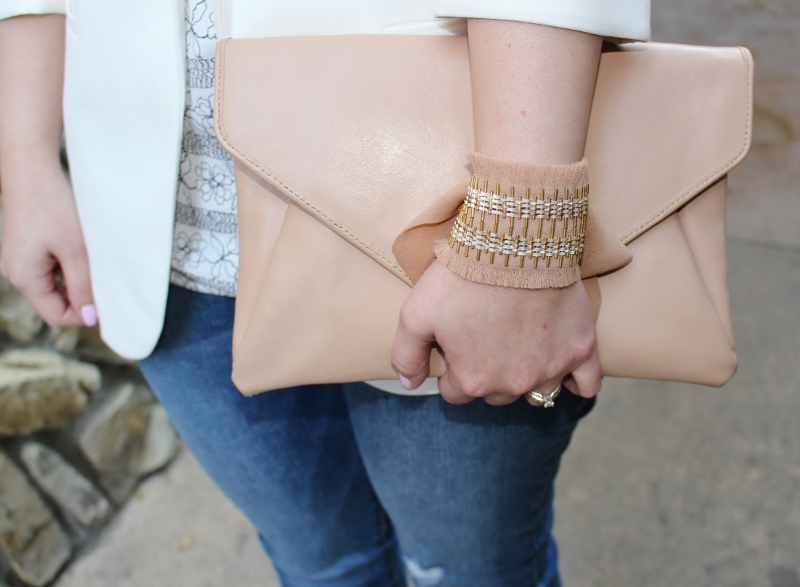 I love embracing warm neutrals for spring, and the bracelet really is a gorgeous piece. So sorry to hear you were sick. Glad you are feeling better and back with such a great outfit. Love the blazer. I need to add a white one to my closet. That is a really cool bracelet! You looks so stunning dear! With this spring forwards! So glad you are feeling better this week! And your outfit really is perfect for Spring! I would easily wear this exact outfit. I would love to know how you feel the LOFT cami compares to the Barcelona cami since that seems to be disappearing from Express. I will need a replacement option.